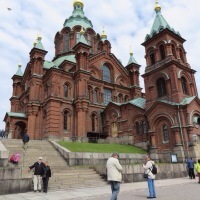 After sailing 251 nautical miles from Stockholm, we landed in Helsinki. It is a pretty industrial port city. The ship docked in an area that was full of cargo ships and commercial vessels. We took a complementary tour that was on a bus. 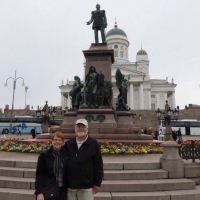 After the bus tour, Mike and I walked around the area for awhile. The tour didn’t end until about 1:00 and we had to be back of board by 4:30. So, not a lot of time to really investigate the town. The walk back to the ship was only about 2 km, but I was really glad to have google maps. We couldn’t see the ship, as big as it was. It was hiding among the huge industrial buildings. 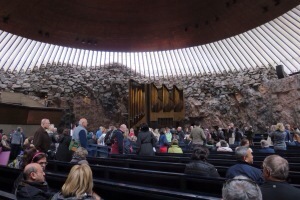 Completed in 1969, the Temppeliaukio church, known as the Rock Church is in the middle of Helsinki. The church is excavated in bedrock; the walls are supported by concrete pillars. The dome is lined with copper. There are grates all around the edge of the church floor that allow the water that has run down the walls to be conducted away. A contest was held in 1932 to design the church. The committee didn’t like the results so another contest was held. But war prevented the next winner’s plan from being built. After the war, the third contest was held and the new church was dedicated in 1969. 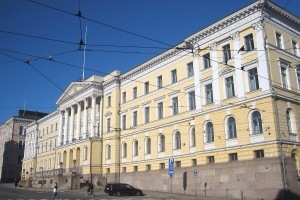 The design was not without controversy, but it is now one of Helsinki’s major tourist stops. 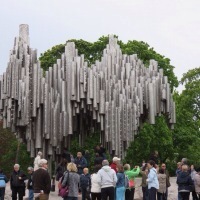 The Sibeliuss Monument is dedicated to the Finnish composer Jean Sibelius. It is made of more than 600 hollow steel pipes. 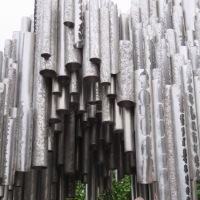 The pipes are welded together in a wavy pattern that is supposed to be like the music of Sibelius. Down by the waterfront there was a little market with food booths and craft items. 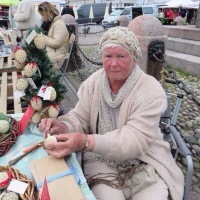 I bought a pretty ornament made from cut willow pieces from the woman below. She wasn’t a smiler. Then we had lunch at one of the booths. 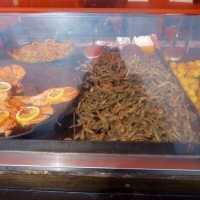 I had salmon soup and Mike had the little fried fishes you see in the picture. They look like big minnows. They flour them up and fry them, head and all.